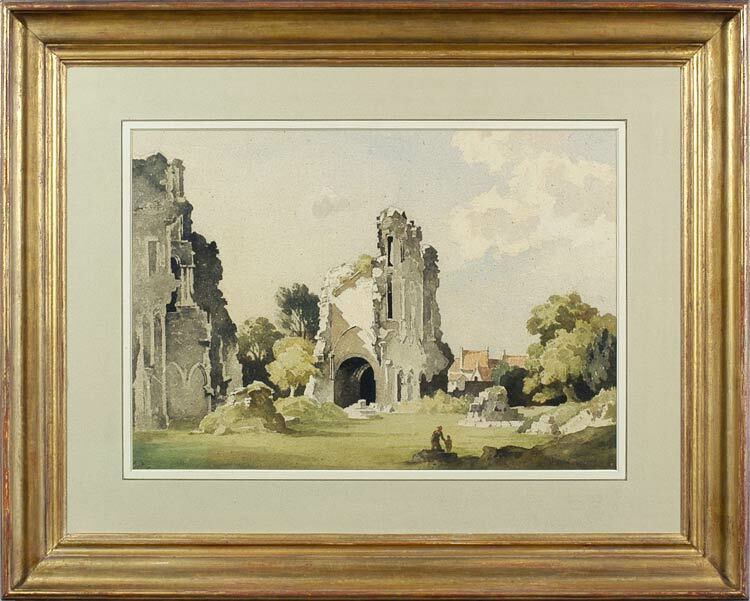 A finished watercolour study of an unidentified site, almost certainly in Britain, with the ruins of a mediaeval castle or abbey amongst trees, with red-tiled houses beyond. Nicholls ranged so widely in his painting tours through Europe and the British Isles that it is all but impossible to track the buildings he visited. In default of a catalogue raisonné, one resource is the very partial list compiled by Andrew Broadhurst at familytreemaker.genealogy.com, where his page on Bertram Nicholls brings together some of the paper and online records of the works. Even a quick glance at this reveals the difficulty of identifying Nicholls’s subjects; he painted, amongst many other sites, Windsor Castle, Goodrich Castle, Dunster Castle, Castle Bolton, Stokesay Castle, Abergavenny Castle, Porchester Castle, ‘castle ruins’ and ‘a sunlit ruin’. None of these named locations seems to be the subject here; nor does it seem to be any of the more notable English abbeys. Wherever it may be, it has been accorded Nicholls’s full and characteristically careful treatment; the composition and lighting underline the drama of the ruins, which are contrasted with the natural setting, the tiny foreground figures, and the group of domestic houses beyond. There may well be an allegorical undertow to this particular arrangement, since the height of the ruins seems to be emphasized in relation to the rest of the landscape, as though to point the fact of their imminent engulfing by Nature, the constant encroachment of more transient domestic buildings, and the place of man (though even more ephemeral) in the foreground of the world.